The deadline to register for my August 4th painting seminar in East Boothbay, Maine, is this Wednesday, July 25. Click here for information and registration online. You can also call 207-633-6849 or email info@gleasonfineart.com to register. To read reviews of my workshops, click here. 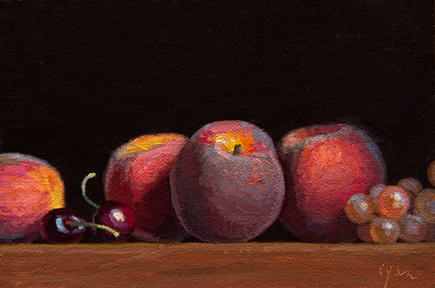 If you enjoy this painting, you may also like to see Golden Series: Peach, Pear, Five Blackberries, Bleu Cheese, or my other paintings in my Golden Series.